As in preceding years, you will find us at SightCity, the world‘s biggest exhibition for aids for the blind and the visually impaired. The exhibition features numerous exhibitors from around the world showing a wide range of products for the blind and visually impaired. There will also be a diverse program of informative lectures on aids and services for the blind and on medical advances in the field. 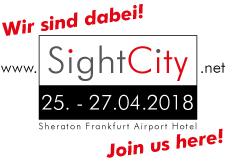 SightCity 2017 will take place from 25th to 27th April 2018 at the Sheraton Frankfurt Airport Hotel, located at the Frankfurt/Main international airport. Pierre Klein, Carsten Bey and colleagues from Comde-Derenda look forward to meeting you at booth C6.